Geoffrey Syme graduated with a PhD in social psychology from the University of Canterbury, New Zealand in 1973. After a postdoctoral year at Ruakura Agricultural Research Centre, Hamilton New Zealand, he developed a long-term interest in human decision-making, planning processes and natural resources management. 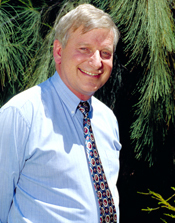 He was a Lecturer in Psychology at the University of Western Australia, Nedlands from 1974 to 1976 and joined what is now the CSIRO Land and Water Division in 1976 rising to the position of Chief Research Scientist. After a decade of collaborative research with water agencies he founded the Australian Research Centre for Water in Society which has been in operation for 15 years. He was Director of the Australian Research Centre for Water in Society, CSIRO Land and Water from 1992 to 2001 and Director, Water Security and Sustainable Communities, CSIRO Land and Water from 2002 to 2006. Geoff has had a long-term interest in interdisciplinary approaches to water resources management decision-making. He has published widely internationally and is currently an Editor in Chief for the Journal of Hydrology and member of the Editorial Boards of: Social Justice Research; Rural Society; Australasian Journal of Environmental Management; People and Physical Environment Research; Open Geography.